It was in the upper 20s when Katherine checked her thermometer on our way out of camp this morning at 6:45am, but it didn’t feel all that bad. Cold in the desert just isn’t as cold as it would be in other places with more humidity…but it’s still cold. It was fortunately a good night last night with no wind, snow, or rain that we noticed. Our canyon cruising continued for the second day in a row and it was pretty cold all day. Thankfully, not windy, so it wasn’t uncomfortably cold. This also meant another full day of using the iPhone for photos, with my Panasonic Lumix not working in cold temps for some reason. It’s fortunate that happened today I guess because it was pretty mundane and only took a handful of photos all day. 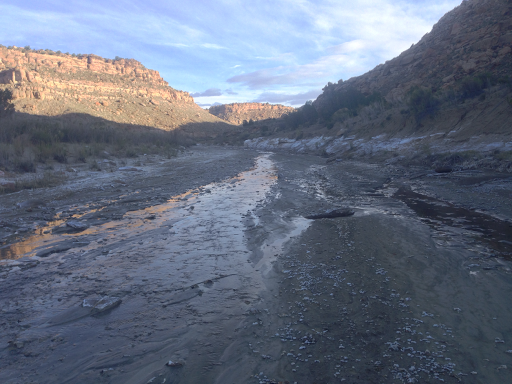 We had a some more miles to do in Last Chance Creek Canyon before we turned into Paradise Canyon. The terrain and views were pretty consistent all day. 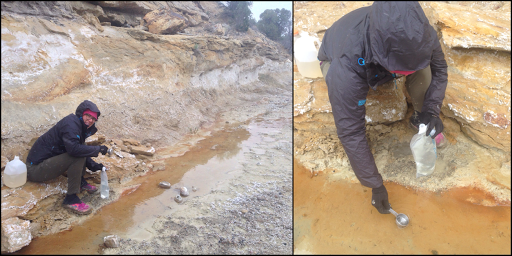 More of the slick claylike mud covered with white powder from minerals in the water that once ran down the cantons. 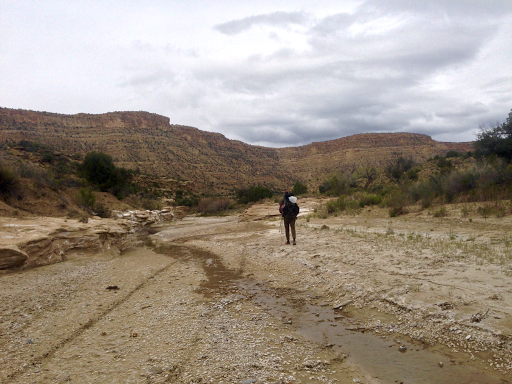 Just crossing the small stream or fully saturated ground constantly to find the driest or least muddy place to walk. The water chart for the Hayduke is interesting as you only have info from what past hikers have done and Skurka hasn’t updated it in like 6yrs…so we’ve done our own research and updated what we could from recent hikers. Katherine is track logging the whole trail for Li Brannfors who has taken it upon himself to really detail maps and combine the pertinent beta from previous hikers. She is also waypointing all the water sources and their quality and going to send it all to Skurka to finally update that bundle. That will be really helpful to future hikers. The difficulty with the Hayduke is that most sources are seasonal and dry up by the end of spring depending on the year. Sources on the water chart are ranked 1-4 on reliability and we have lots of 2s that are very iffy. We have to be cautious, assume sources will be dry, and carry enough water as if they are dry. Anything else we come across is a bonus. Today was a big example of that. We were not sure of our sources and grabbed a lot this morning thinking it could be over 30mi to our next for sure water, but that there’d probably be water before then. Well, it turned out that much of the day we had a small trickle of a stream pretty much running down canyon on and off. 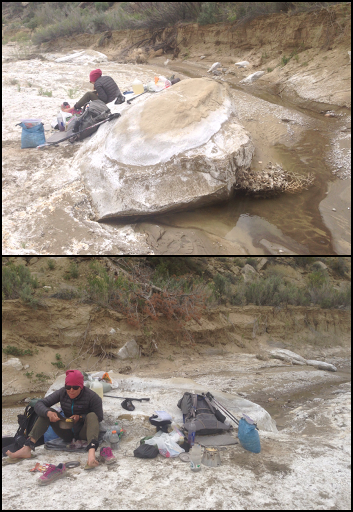 We still carried our heavy loads not knowing if each time the stream stopped if it would ever reappear. Frustrating to carry 6L of water today and to keep seeing water much of the day, but we just had no way of knowing when it would disappear completely. All of the water is highly alkaline and I’ve been dodging those sources pretty well since I had my stomach issues early on this trail. There’s not way to know for sure if that’s what caused me to get sick, but here was no avoiding it today. I’ve now drank liters of that alkaline water and it does make my stomach gurgle, but I’m hoping for nothing more than maybe some loose stool since I have to drink it again all day tomorrow and possibly the next. Here is our wonderful source we were lucky to hit for lunch today (thinking it’d be our last til the end of the day). We got a pothole behind a rock and took the opportunity to cook dinner for lunch figuring we wouldn’t have water at camp to cook tonight. As we ate, little snow flurries would fly down from time to time. The clouds built more as the day went on. Other than the water concerns and cold weather, today was very mundane, but we both welcomed the break for a bit. The terrain was very unstable with either slick mud of varying depths or deep sand to slog through. It was not the fasted moving, but better than the pace of boulder scrambling. 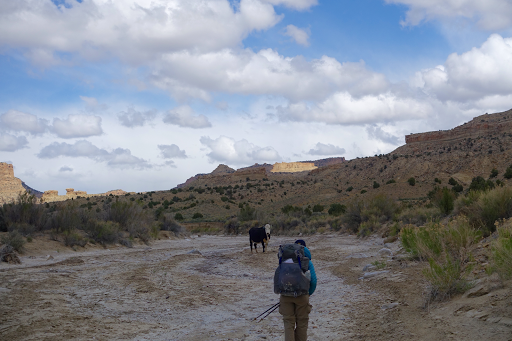 Again, my bad ankle wasn’t having it with the combination of the terrain and heavy pack load. It was giving me strong complaints and was unstable, so I gave in and wore the ankle brace I carry for such occasions. The brace actually helped and I’m relieved it did as it made the day much more enjoyable. It was just us and the cows today! The second day in a row without seeing anyone else. I listened to more of The Interestings audiobook and it’s fine so far. I’m halfway through and still wondering why it’s such a bestseller? I’m thinking it will get more “interesting” the second half. At the end of the day, it started snowing fairly steadily just before 5pm, which was when we also hit our ideal goal distance for the day and our final for sure water for 30mi. Well, it was ranked a 3 on the water chart, which is highly reliable, but it was dry. It was only 5pm, so we grabbed the water we needed for about 48hrs from pretty much a puddle about 100yds back on the trail. 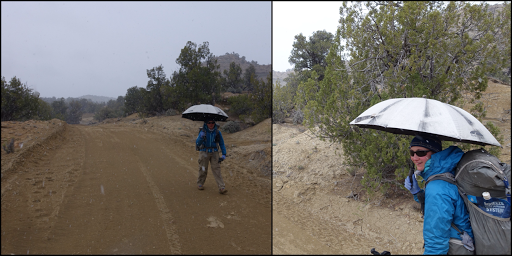 Here is Katherine in the snow doing her best to stay warm while using a scoop to get liters of water for the long carry. It was quite the uncomfortable chore with frozen fingers at the end, but that’s just part of the Hayduke. We do hope to see water in the next 48hrs, but are carrying enough if we don’t. I took 7L and Katherine took 9L, again choosing to carry a gallon in the jug in her hand rather than carry those 8lbs on her easily strained back. 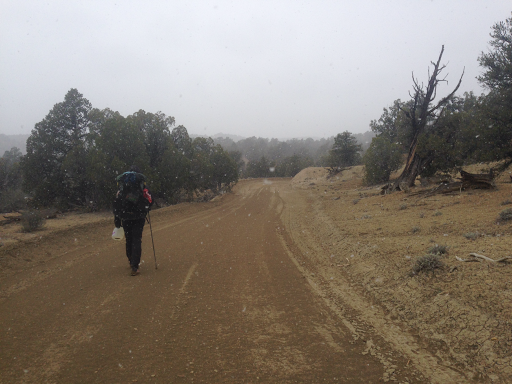 We hiked on through the snow, which didn’t accumulate, for another hour and a half or so. Yes, SNOW! We expect nothing less from the Hayduke where it could snow one day and have sweltering heat the next. It’s been nice to hike with Katherine who also isn’t perturbed by these discomforts of hiking. 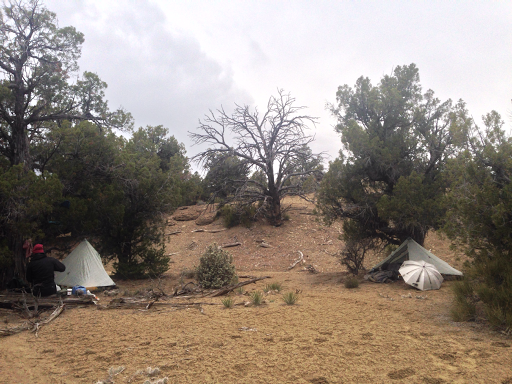 Many would have set up camp at 5pm with snow and a water source, but we both enjoyed hiking on til just before 7pm and don’t mind dry camping since it got us now that many miles closer to the next water. With the higher humidity tonight, the cold is much damper and more cutting. I feel like this is our coldest night yet. Rain pants are on again for added warmth and I have my down jacket and hood on along with my beanie and buff to keep my head and torso warm. Temps should rebound tomorrow.